Kymco Agility RS 50, Available in Black, £1471 â€œOn the Roadâ€ inc Road Tax,etc, £99 minimum deposit, 36 monthly payments of £45, Please contact us for a full personal quote. 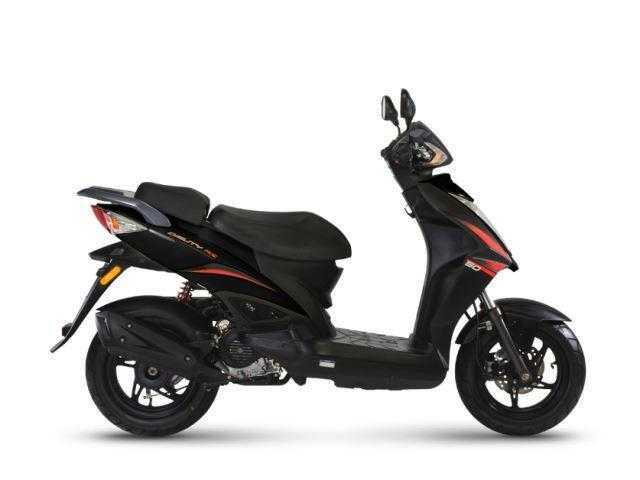 With its bold sport design, this scooter has massive street appeal and road presence, and at an unbeatable price it offers riders fantastic value for money. The RS 50 is quick off the mark and with a net weight of just 95kg it is light, agile and therefore ultra easy to handle and park. Edgy red graphic panels, sleek lines, 12 inch spoked alloy wheels and striking black paintwork all combine to reinforce the RS 50â€™s impressive sports.